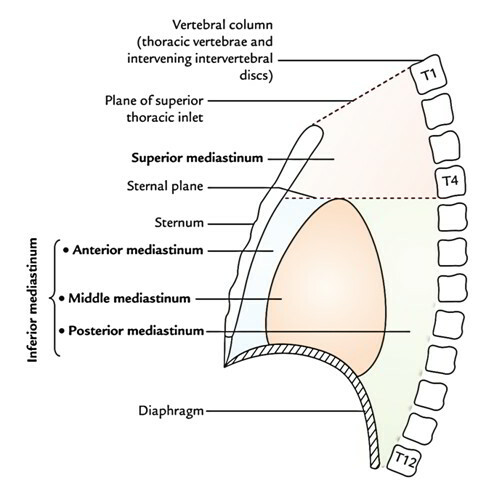 Superior: Transverse thoracic plane separating superiorand inferior mediastinum. On every side: Mediastinal pleura. 2. Superior and inferior sternopericardial ligaments stretching between sternum and pericardium. 3. 3 or 4 lymph nodes. 4. Mediastinal branches of internal thoracic (mammary) arteries. 5. Lower portion of thymus (in children). The anterior mediastinum is an incredibly narrow space. It’s continuous via superior mediastinum with the pretracheal space of the neck. For that reason, neck infection in pretracheal space may spread into the anterior mediastinum.